DIE Mercurii, 31 die Octobris. L. Arundell of Trerice introduced. Message to H. C. to appoint a Committee to join with one of the Lords, to attend the King with the Votes to banish Priests and Jesuits, &c.
King will be attended with them and the Votes against French Commodities. D. Bucks and L. Butler released. This Day the Lord Arundell of Trerice was introducted, in his Robes, between the Lord Bellasyse and the Lord Gerard of Brandon, the Lord Chamberlain of His Majesty's Household supplying the Absence of the Lord Great Chamberlain of England; all of the aforesaid Lords likewise being in their Robes, and Garter Principal King at Arms going before. His Lordship's Patent of Creation and Writ of Summons were by Garter, kneeling, laid upon the Woolsack where the Lord Chancellor sat; and the same being delivered to the Clerk of the Parliaments, the Writ was read; and then his Lordship was placed next below the Lord Fresheville, upon the Barons Bench. 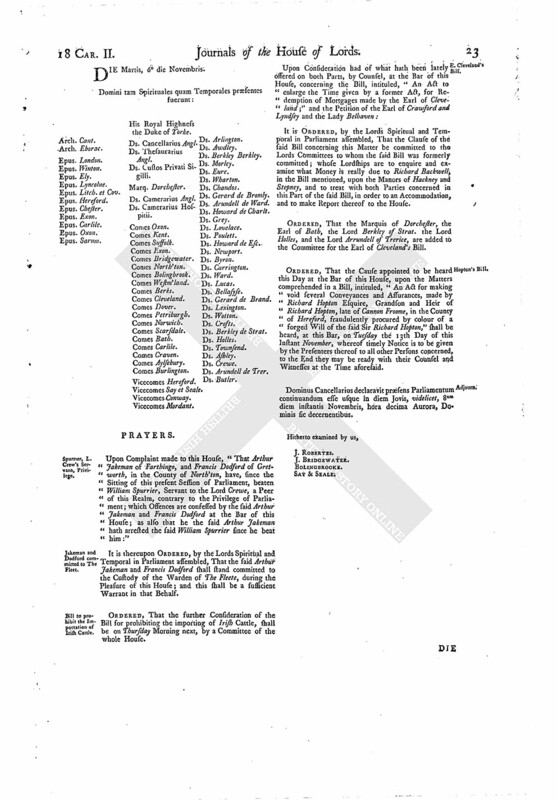 To let them know, that this House hath concurred in the Votes concerning Priests, Jesuits, and Papists; and that this House hath nominated a Select Committee of Twelve Lords, to present the same to the King; and to desire the Commons would appoint a proportionable Number of their House to join with the Lords therein. For the Time, the Lords intend to send to the King, to know His Pleasure; and upon His Majesty's Answer, their Lordships will send them Notice of it. 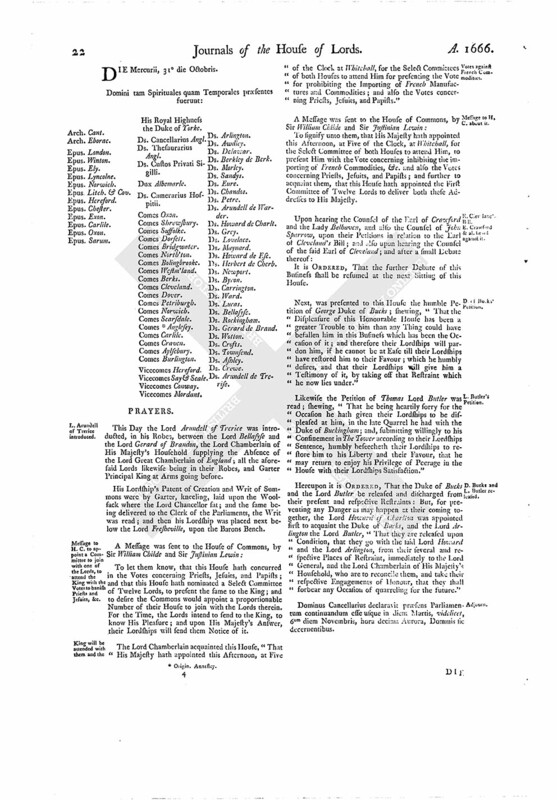 The Lord Chamberlain acquainted this House, "That His Majesty hath appointed this Afternoon, at Five of the Clock at Whitehall, for the Select Committees of both Houses to attend Him for presenting the Vote for prohibiting the Importing of French Manufactures and Commodities; and also the Votes concerning Priests, Jesuits, and Papists." To signify unto them, that His Majesty hath appointed this Afternoon, at Five of the Clock, at Whitehall, for the Select Committee of both Houses to attend Him, to present Him with the Vote concerning inhibiting the importing of French Commodities, &c. and also the Votes concerning Priests, Jesuits, and Papists; and further to acquaint them, that this House hath appointed the First Committee of Twelve Lords to deliver both these Addresses to His Majesty. It is ORDERED, That the further Debate of this Business shall be resumed at the next Sitting of this House. Next, was presented to this House the humble Petition of George Duke of Bucks; shewing, "That the Displeasure of this Honourable House has been a greater Trouble to him than any Thing could have befallen him in this Business which has been the Occasion of it; and therefore their Lordships will pardon him, if he cannot be at Ease till their Lordships have restored him to their Favour; which he humbly desires, and that their Lordships will give him a Testimony of it, by taking off that Restraint which he now lies under." Likewise the Petition of Thomas Lord Butler was read; shewing, "That he being heartily sorry for the Occasion he hath given their Lordships to be displeased at him, in the late Quarrel he had with the Duke of Buckingham; and, submitting willingly to his Confinement in The Tower according to their Lordships Sentence, humbly beseecheth their Lordships to restore him to his Liberty and their Favour, that he may return to enjoy his Privilege of Peerage in the House with their Lordships Satisfaction." Hereupon it is ORDERED, That the Duke of Bucks and the Lord Butler be released and discharged from their present and respective Restraints: But, for preventing any Danger as may happen at their coming together, the Lord Howard of Charlion was appointed first to acquaint the Duke of Bucks, and the Lord Arlington the Lord Butler, "That they are released upon Condition, that they go with the said Lord Howard and the Lord Arlington, from their several and respective Places of Restraint, immediately to the Lord General, and the Lord Chamberlain of His Majesty's Household, who are to reconcile them, and take their respective Engagements of Honour, that they shall forbear any Occasion of quarreling for the future." Dominus Cancellarius declaravit præsens Parliamentum continuandum esse usque in diem Martis, videlicet, 6um diem Novembris, hora decima Aurora, Dominis sic decernentibus.